After a delayed start to our planting season, we were able to plant both corn and soybean across the state in record or near-record time during May. This coincided with our hottest May on record, which was also dry in many areas of the state. This has allowed crops to emerge out of the ground quickly and rapidly progress through growth stages. We already have reports of waist high corn and flowering soybeans across the state. This article serves as a reminder for growth stage, height restrictions, and pre-harvest interval cutoffs for herbicide applications in both crops. Corn. There are a number of corn fields that did not receive a preemergence herbicide before the crops emerged from the ground. Many of these preemergence herbicides can also be applied postemergence. Some of the earliest cutoff timings are 8-inch corn for broadcast applications of 2,4-D, and any atrazine must be applied before corn reaches 12-inches in height. If corn is 12 inches or taller, the atrazine must be left out of the tank. 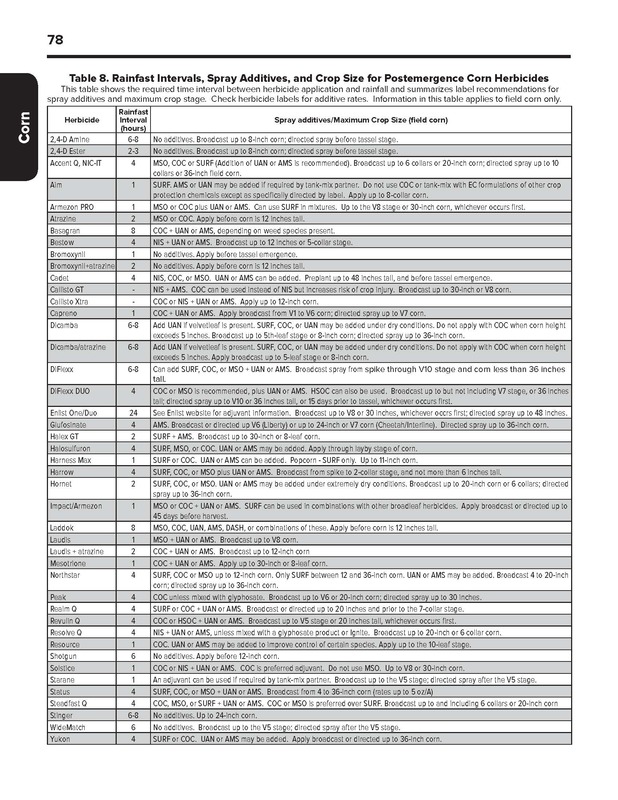 See table 8 in the weed control guide for height and growth stage restrictions of postemergence herbicides in corn. Soybean. Even though we are still a few weeks away from the summer solstice, we are seeing soybeans start to bloom across the state. Shawn Conley at the University of Wisconsin wrote a nice article explaining some causes behind this (http://coolbean.info/2018/06/03/soybean-flowering-summer-solstice-fallacy/). What this means for herbicide applications, is that the window of application for some postemergence herbicides has either ended, or is about to end in those fields that are entering reproductive stages. We have heard reports that up to 25% of our soybean acres might be Liberty Link, and up to 50% could be Roundup Ready Xtend varieties. The cutoff for glufosinate (Liberty, Cheetah, Interline, others) applications in Liberty-Link soybean is R1. In other words, once the soybeans are flowering, applying glufosinate is off-label. The cutoff for Engenia, FeXapan, and Xtendimax in Xtend soybeans is R2, or full flower. With these flowering soybeans still being small in many areas, it is imperative to include residual herbicides in these postemergence applications to help reduce weed pressure until crop canopy. 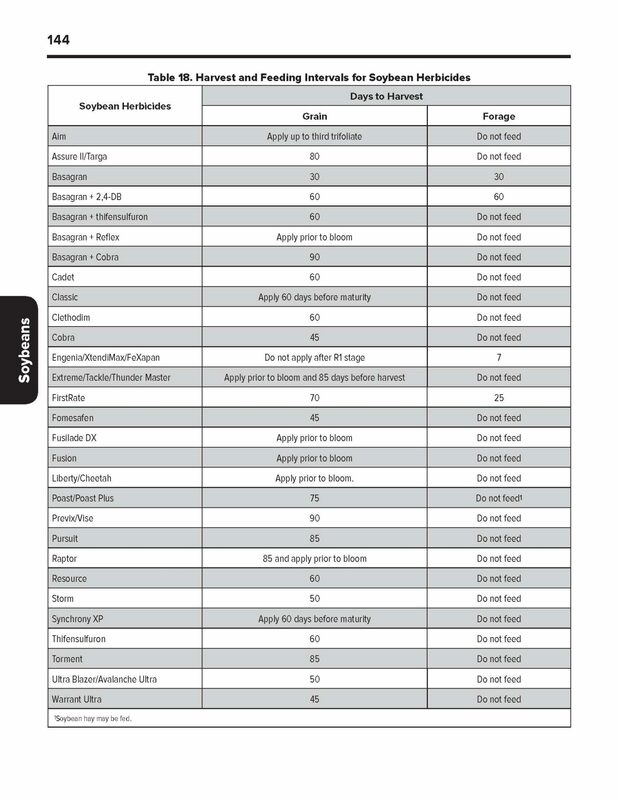 See table 18 in the weed control guide for growth stage restrictions and pre-harvest intervals of soybean herbicides.